WW1 Reenactments Equipment : Great War Tommy WW1 Food Rations Labels : Armour brand Evaporated Milk label, 1916. WW1 Reproductions and WW1 Reenactors Equipment / Kit - Armour brand Evaporated Milk label, 1916. "Armour" brand Evaporated Milk label, 1916. Armour's "Veribest" Brand (Chicago, USA.) 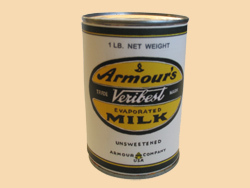 Evaporated Milk as supplied to Allied Forces in many theatres.